We are very pleased to introduce our fourteenth ‘St John’s Music Festival’ as part of the ongoing Music at St John’s programme of events. As a church, St John’s Boxmoor has a long established music tradition, with a choir of high standard. Since the closure of the ‘Pavilion’ in Hemel Hempstead, the church has become a popular venue for several local choirs including The Aeolian Singers and The Dacorum Community Choir. Other choirs and orchestras from the Dacorum area also use our wonderful facilities. 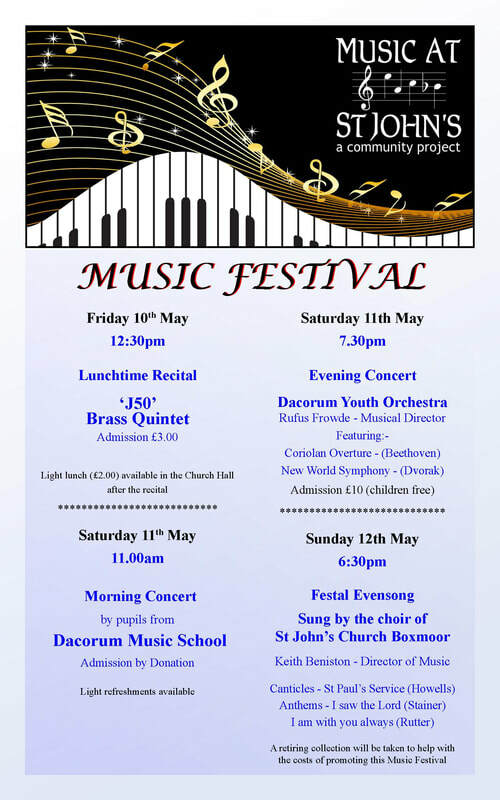 This year’s Music Festival offers a wide variety of ‘musical fare’ and we do hope that you will support as many of these events as you possibly can to help make our Festival a resounding success.